Author Colu Henry grew up beside her grandmother at the stove every Sunday, helping cook their family's favorite Sunday Sauce. Colu speaks reverently about the ritual of watching that beloved sauce slowly bubble, incanting ingredients to me like only the most devout chef can. 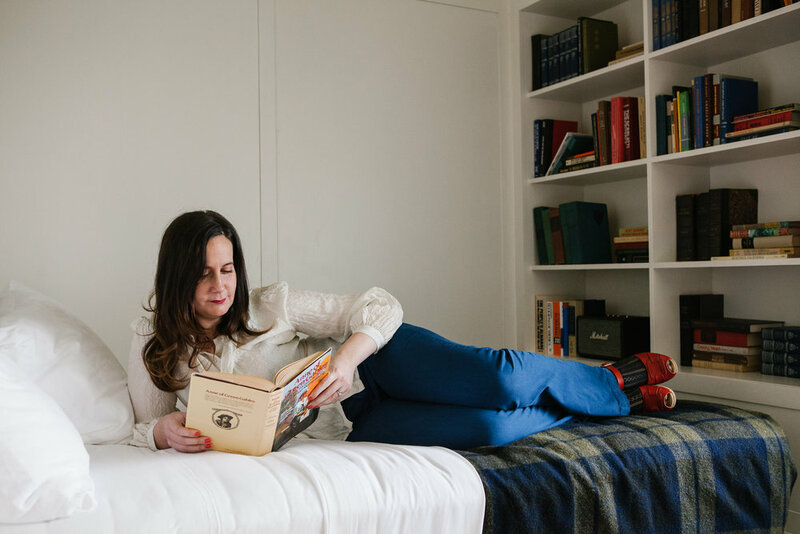 Colu is a food-lifestyle expert, a native New Yorker, and is currently working on her first cookbook, Back Pocket Pasta, which will be published by Clarkson Potter in 2017. She currently splits her time between Brooklyn and Hudson, New York, with her husband Chad and their dog Josh. Special thanks to Rivertown Lodge, the wonderful setting for our photographs. GAL: What was the name of the first book you fell in love with, that turned you into a life long reader? CH: I have to be honest with you: it was Little House on the Prairie. GAL: I have to be honest with you: same, and you are now my best friend. CH: (laughs) I know, I love you! Those books changed my life! Part of the reason I loved those books so much is because Laura Ingalls Wilder ended up becoming a writer, which really spoke to me. It is so cool that she was able to capture that point in time so vividly. Also, at a time that was especially interesting for a woman to be writing about all the things she experienced. I think my other ones would be the Betsy-Tacy series. Are you familiar with the Betsy books? By Maude Hart Lovelace? GAL: Are you KIDDING ME? Those are MY other favorite books that turned me into a life long reader! CH: No! No way! I love you so much! Aren't those books incredible? GAL: We were meant to be! Yes, they really are. It’s so interesting that those books are your first favorites, because food plays a crucial role in both the Betsy-Tacy and the Little House books. The pages spent on Betsy's father's Sunday night lunches and Laura's mother's ability to craft a tasty meal out of even the grimmest harvest tell us so much about what life was like during those periods of time, and lend so much flavor to their individual stories. It makes so much sense that you would gravitate toward them given how much time you spent in the kitchen as a child learning how food can be prepared, and how it can also enhance and strengthen family life. CH: Yes, absolutely. Those experiences are part of why I am doing what I do today. GAL: What inspired your forthcoming book, Back Pocket Pasta? CH: I grew up in a very Italian and pasta-forward household. We had meat sauce on Sundays and pasta another 1-2 times a week. It's a dish I can always turn to that makes me think of home. I've worked in the food industry for over a decade and spent the last four in food publishing. I worked long hours and came home and turned to my pantry and seasonal produce to pull together quick and beautiful dinners for myself and husband Chad. I started tagging these meals with #backpocketpasta on Instagram to encourage others to share their pastas with me too. Many stars aligned and Back Pocket Pasta the book followed shortly after. Back Pocket Pasta is mindset. Look around the kitchen, shop seasonally and have a well stocked pantry. A beautiful dinner is no more than a boiling pot of water away. Colu in the serene lobby of the Rivertown Lodge. CH: To be honest with you, I try to read on the weekends only. It’s been challenging to keep up with reading because I’ve been writing so much. Sometimes you need to just step back from it and take a bit of a break. I did just start reading My Brilliant Friend, which I’m really excited about because of the Neopolitan collection we share, and because it’s truly fantastic thus far. I’m also reading Goodbye To All That (an essay in Slouching Towards Bethlehem) by Joan Didion and loving it deeply. So, in total, approximately 1-2 times a week. GAL: Do you have a favorite bookstore in Hudson? A favorite one in the city? CH: When I was a kid in the city I was at the library all the time. As an adult in the city I never really utilized libraries. Realistically, I probably just never had time. There’s a great bookstore in Hudson called The Spotty Dog, which is a bar and a bookstore. It’s the best. It’s kind of run down, but reading and drinking at the same time is genius. I go there. GAL: What cookbooks do you cherish the most? Are there certain ones you can't live without? CH: Definitely Marcella Hazan’s cookbook, Essentials of Classic Italian Cooking. All of the Ottolenghi books because I try to watch what I put into my body. 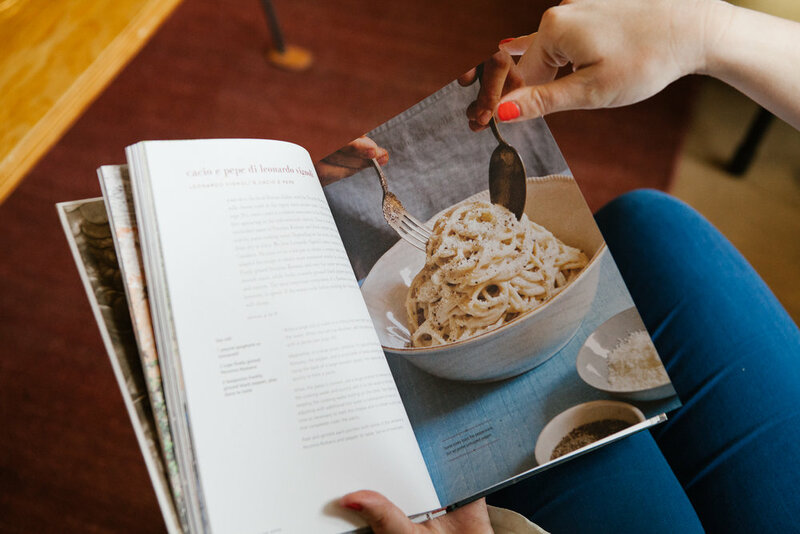 I don't usually cook from these books verbatim – they function more as inspiration. I think honestly a lot of cookbooks for me are like that. Fun to leaf through, to get ideas from, and then sort of tweak the recipes with your own ideas along the way. I love the Gourmet cookbook that came out years ago. Of course, I’m obsessed with Ruth Reichl, who isn’t! I love my copy of it very much. It was a birthday gift from my husband about 12 years ago. Mimi Sheraton's books are essential as well. GAL: Is there one particular cookbook that has significantly influenced your work? CH: When I was in college, I was reading Ruth’s first book, Tender At The Bone. She left The New York Times and was writing books instead. It's a story of her life, interspersed with recipes. There was a recipe for a raspberry tart. I didn’t know how to bake at the time, but I really wanted to bake this tart. So I went out and bought all the supplies, including the baking pans and other kitchen supplies that my college student self did not possess. Ruth's writing made it clear that cooking and writing about it was something I wanted to pursue. Making that tart was a gateway for me in terms of shaping my career. GAL: It's early summer here in the USA, and such wonderful time for cooking with fresh ingredients. Is there one recipe you're currently obsessed with right now? Or a type of ingredient that you can't seem to get enough of? CH: Snap peas! I can't get enough. I've been eating them like candy out of the fridge. You know what else they are good for? Pasta! Sauté them in olive oil with a little bit of green garlic and whatever leafy greens you have in your fridge. Toss with spaghetti and lots of grated cheese. CH: A lot of it is by word of mouth. Usually books that friends have suggested. If I do pick up a random book, read the first two pages and immediately want to keep reading, I’ll buy it right then and there. If I’m not fully immersed and instantly interested, I’ll put it down and move on. An old family friend of mine once said to me, “Pick up a book. If you can’t read it at this point it’s not the right time in your life. Put it down. Try it again sometime again in your life, and maybe it will be the right time for you.” I firmly believe that. I read East of Eden about 5-6 years ago. I have never felt more in love. I have read it twice, since the first time when I absolutely devoured it. A lot of the books that speak to me are really family driven and involve a cultural history, especially in terms of food. GAL: Do you read on a device? CH: No, I don't have a device. I like the feel and the smell of a book. There’s a real connection with the action of reading with holding a physical book. With that said, if I’m traveling over a long period of time, I’d probably look into getting a device. GAL: Do you prefer fiction or non-fiction? CH: I’m a fiction driven reader. But if it’s by someone or about someone I’m really interested in, then I’ll devour their non-fiction work. GAL: We have a friend who has a “Sanity Shelf” dedicated to books she returns to again and again, to reread for pleasure, knowledge, and solace. What would be on your Sanity Shelf? CH: An Everlasting Meal by Tamar Adler, East of Eden by John Steinbeck and Tender at the Bone by Ruth Reichl. GAL: Please recommend at least three books and give the reasons for your choices. CH: Love All by Callie Wright. Brilliant story by good friend. Euphoria by Lily King. Provocative, steamy, historic. Gone Girl by Gillian Flynn. Guilty pleasure. Follow Colu on Instagram, order her book, and check out her website. All photos are courtesy of Laurel Golio. Want to visit Hudson? Check out the chic Rivertown Lodge, The Spotty Dog for a beer and a book, and Wm. Farmer and Sons for a delicious meal.